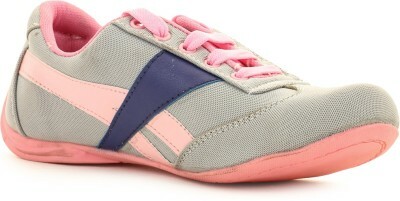 Ladies, begin your daily workout session with a walk in these Sporty walking shoes from Select, and look half your age. Crafted keeping in mind the fitness needs and style preferences of women, these shoes will help you go about your exercise routine in style. These shoes are made from canvas and feature grey and pink coloursdesign with pink laces for adding pep to your gym wear. A strong believer in fashion and its power, the brand Select focuses on bringing out the latest trends in fashion and making them accessible to everyone. Their footwear collection features designs and patterns that the poised urban woman can relate to. Footwear care Use a damp cloth to clean dirt or grime.